When a person has full mobility but is at risk of climbing or falling out of bed, Kinderkey’s beds can improve their comfort and safety. 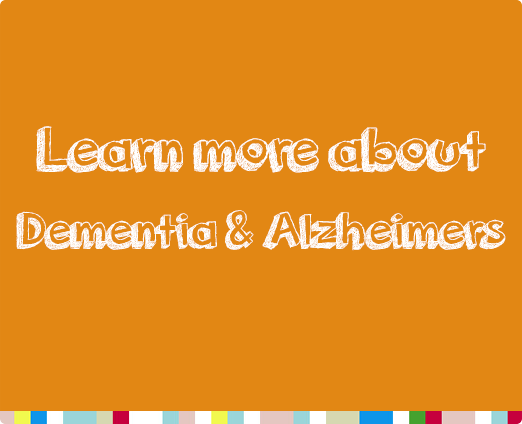 For people who have dementia or Alzheimer’s, having the appropriate bed is crucial to help with nocturnal orientation problems. People with these conditions may sleep during the day but at night they find it difficult to rest as they feel disorientated and they try to get up and walk around – these sleep problems are linked to disruption of the body-clock. With its extra-low height setting at just 220mm from the bed frame to the floor, the Kinderkey Stellan improves safety and comfort, while reducing the risk of injury when exiting the bed. The cut-out side allows safe exit, feet first, while offering protection from rolling out of bed. By placing the bed against the wall, this enables full-height padding on one side. 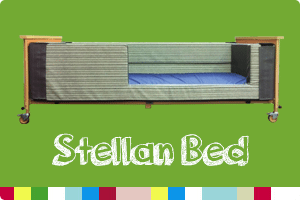 The Stellan is compatible with dynamic air mattresses, foam mattresses and the Stabilo positioning sleep system. 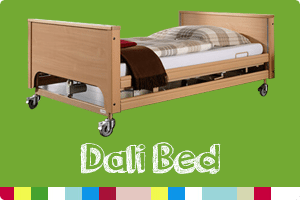 Our Dali electric nursing bed is also ideal for people who have dementia or Alzheimer’s. Available in metal or wood alternatives, it has side rails – including the higher side rails of the Dali Extra Low electric nursing bed – to protect against falling out of bed. The bed’s adjustable height, back and upper leg rest combine to provide extra comfort, further helping to create a relaxing and comfortable environment at night to promote restful sleep. Everyone’s needs are different and we offer a home visit from a product specialist to assess the most suitable individual option.